Medical oncologist Matthew Matasar leads a clinic specially designed to help lymphoma survivors address any long-term health conditions that might arise. At Memorial Sloan Kettering, we know that a diagnosis of cancer affects you and your loved ones in many different ways. We’re committed to supporting you and maintaining your well-being in every way we can — physically, emotionally, spiritually, and otherwise — for as long as you need us. Our doctors work closely with a team of specialists who address various needs that may arise during diagnosis, treatment, and survivorship of a patient with lymphoma. Thanks to major advances in the understanding and treatment of lymphoma, more people than ever are enjoying productive lives for years, sometimes decades, after being declared free of the disease. But even with improvements in delivering treatments like chemotherapy and radiation, lymphoma patients may be at higher risk for heart disease, skin cancer, lung conditions, and other complications. Recognizing that some lymphoma patients develop long-term health conditions, MSK established a program to quickly identify and address these issues. Our Lymphoma Survivorship Clinic welcomes MSK survivors of all ages, as well as people initially treated for the disease at other institutions. 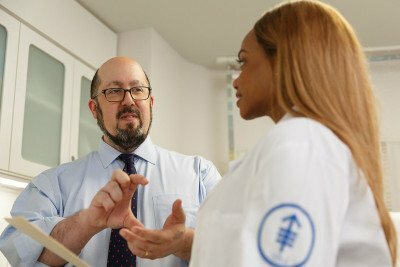 Housed within the Lymphoma Service at MSK’s 64th Street Outpatient Center, the clinic focuses solely on survivors of lymphoma, as soon as three years after you end treatment. These experts are at the top of their field in survivorship issues, such as heart, lung, and reproductive health. The clinic is also able to offer access to clinical trials and other research that can help people facing the late effects of lymphoma treatment. I am a nurse practitioner (NP) with special training in lymphoma cancer survivorship issues. I graduated from Northeastern University’s nurse practitioner program and have been working at Memorial Sloan Kettering as a NP since 2015. I focus on the long-term effects of cancer treatment and am dedicated to improving the quality of life of my patients. Fertility is an important and very personal concern for many of our patients. Our experts can help explain how different treatment options can affect the ability to have and bear children. We also go over the many choices we can offer — both before treatment and during it — to give you the best chance of preserving your fertility. Beyond the many other health issues it causes, smoking is a serious risk factor for many types of cancer. It can also make cancer treatments less effective. If you smoke, we want to help you stop — now — to reduce your risk of developing a second cancer or impairing your treatment.